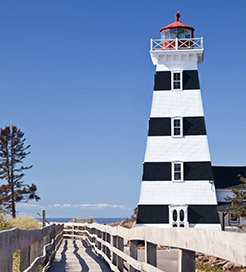 Prince Edward Island, also called the Garden Province, is one of the four Atlantic provinces of Canada. With a predominantly pastoral landscape, it’s mostly known as the location for Lucy Maud Montgomery’s classic 1908 book ‘Anne of Green Gables’. Named after the Duke of Kent, the father of Queen Victoria, the island was captured by the British from the French in the 18th Century, and was subsequently regularly visited by English monarchs for its idyllic beauty. Its natural scenery encompasses rolling hills, dense woods and reddish coloured beaches with a dramatic backdrop of red sandstone cliffs. As the smallest province in Canada, it’s also the most densely populated and is easily navigable. In fact, the Confederation Trail is lauded as one of the world’s finest cycling routes, stretching 435 kilometres along flat grassland and rocky stones. The outdoor itinerary also includes canoeing, kayaking and fishing; the island is surrounded by warm Atlantic waters which allow seaside fun for months on end, having hosted the Canada Summer Games in 2009. For a more family-oriented day out, the beautiful, sweeping beaches offer excellent camping spots and early morning walks or biking excursions, while there is also a selection of exciting theme parks, ideal for children. With a humble population, the culture on Prince Edward Island is distinct. Aside from its affinity with literature, it hosts numerous celebrations including the annual Charlottetown Festival; featuring a range of theatre acts from May to October, the jazz festival; a week-long series of concerts, and several newly introduced food festivals such as the Fall Flavours. In terms of cuisine, the island is well known for its ‘farm and ocean to table’ culture. Getting the ferry to Prince Edward Island is quick and easy, with regular sailings every day across the Northumberland Strait to the port of Wood Islands. Departing Caribou on Nova Scotia, the crossing lasts just over an hour, linking two of Canada’s Maritime Provinces. For more information, please visit our Ferries from Nova Scotia to Prince Edward Island page.